In a language of flowers carnations in general symbolize bonds of affection, health and energy, a fascination for another person. Roses are multi-petal flowers available in an array of colours. Some varieties are known for their prickles along the stems of the plant, which are used to deter predators. Many species are now cultivated although there are still varieties that grow in the wild. With strikingly tall upright spikes of summer flowers, Gladioli can look especially stunning in cut-flower displays as well as in the garden. The flower blooms arrive in the early and midsummer, in a wide variety of colours from cream-white right through to lilac, pinks, blues, purples, and indigo. 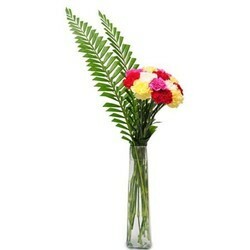 We are a recognized entity, engaged in providing the best-in-class range of Carnation Flower for our clients. Carnations is a perennial plant. They are sweet scented and come in numerous colors.Flowers are 2 to 3 inches wide on 1- to 2-foot stems.The meanings of carnations include fascination, distinction, and love. Like many other flowers, different messages can also be expressed with the flower's different color varieties.Our carnation flower help you express love, luck, and so much more.